Ohmygoodness. I cannot believe it’s December already!! I mean… I know we all say that every year, but sheesh! Wasn’t that like the fastest October and November that have ever happened?? Speaking of… how was your Thanksgiving? I skipped out on a week of blogging, and it feels like it’s been FOREVER since we’ve had a good chat! Our Thanksgiving was pretty wonderful. We bought a Christmas tree in the morning, ate our feast for three in the afternoon, and watched Disney’s Frozen at night. By the end of the day we were stuffed, sleepy, and happy. Just the way a perfect Thanksgiving day should end. And then we woke up on Friday to an explosion of Christmas and found ourselves up to our eyeballs in icicle lights, trips to the attic for boxes of ornaments, and peppermint bark. Ehh…. ok, so I had already started the peppermint bark like a waaaaaaaay long time ago. But you get the picture. And you know what? I feel like I’m seeing holiday fudge everywhere. All of my friends are posting fudge. Fudge, fudge, fudge. And if you know me, you know I can stand to be left behind. So…. fudge it is! 2) It’s DIVINE. It’s part caramel, part fudge and 100% amazing. Prepare an 8x8 or 9x9 baking dish by lining it with foil or parchment. Lightly spray the lining with a non stick cooking spray. Over low heat, melt the white chocolate. Once white chocolate is smooth and completely melted, mix in the dulce de leche and a pinch of sea salt until completely incorporated. Mixture will be thick. Melt the milk chocolate morsels in the microwave (about 45-60 seconds of heating). Pour the melted chocolate over the fudge and spread evenly. Sprinkle with a pinch of sea salt. 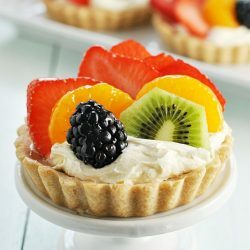 Cut into 1 inch pieces to serve. *This can be found in the Hispanic food aisle. OR you could boil a 14 ounce can of sweetened condensed milk for 3 hours and let cool completely. **I prefer candy melts. You can heat candy melts at a higher temperature than white chocolate, which speeds up the process a bit and ensures a smoother melted product. White chocolate works just as well, but you'll need to melt it MUCH slower to avoid seizing or burning, never increasing the heat from LOW. This fudge looks divine! I hope you had a great Thanksgiving! 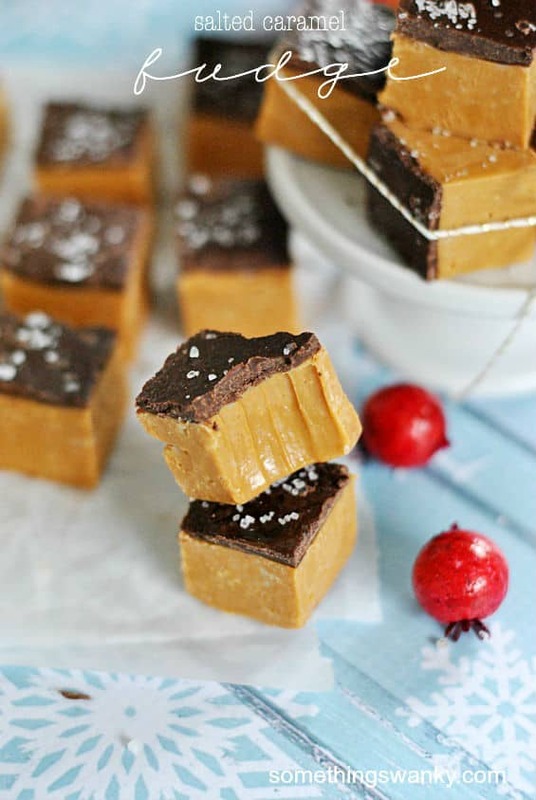 Love the idea of using dulce de leche in fudge, genius! My husband could eat that stuff by the can :) Glad to hear you enjoyed Thanksgiving, what were your thoughts on Frozen? Chocolate, salt and caramel? I’m in! I saw the words salted caramel and fudge and I knew I was going to be in love with this!!! 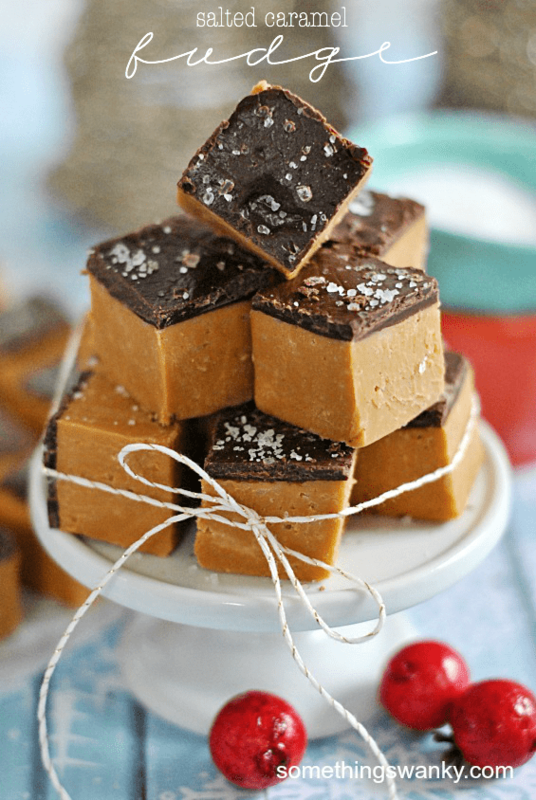 Girl, I freaking love this fudge…using the dulce de leche is a genius move!!!! Holy cow. You’re a genius! I live in NZ too I am pretty sure nestle caramelised sweetened condensed milk (as they are made the same way) would work. I will et you know after I try with my neice tomorrow. This is some killer lookin’ fudge. I took a week break for Thanksgiving, too. It was so hard getting back into the groove of things. 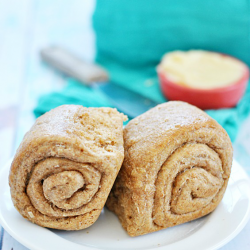 Pinning this recipe, for sure! I am adding this recipe to my holiday baking. My friends are going to LOVE this fudge! Looks amazing! And OMG it’s CHRISTMAS time already?!?!!? Like Wilton’s or Almond Bark… do those sound familiar? I made this yesterday and it tastes yummy but it does not look like your pic at all. The caramel part looks very light, almost a cream color. Hm… how was the consistency? Did it firm up well? It did firm up but didn’t look like caramel at all. Made this today! 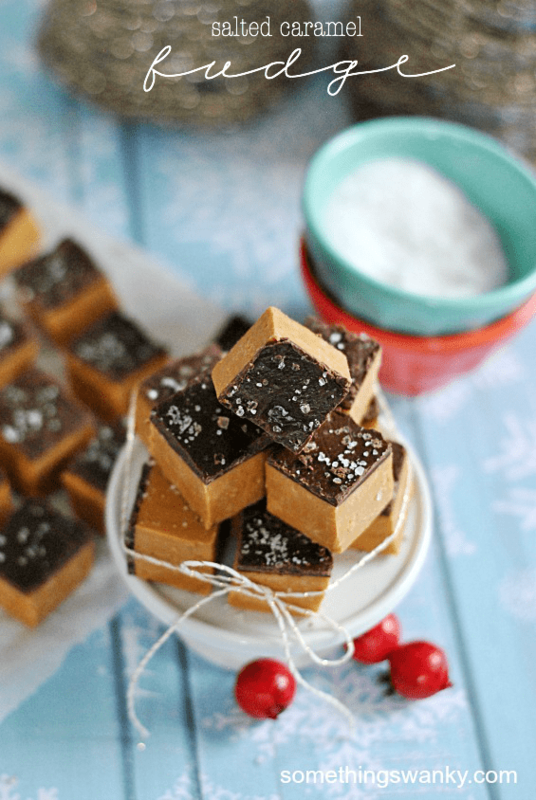 I had cookies on today’s to-do list, but after spending 2 1/2 hours shoveling snow this morning, this easy-to-make fudge recipe won out! Can’t wait to try it! Found la lechera at my store. Will this work for the dulce de leche? Hello! I tried this recipe a few minutes ago with Market Pantry White Chocolate Chips and Nestle La Lechera Dulce de Leche. I’ve worked with chocolate before, so I am well aware of how finicky it is. I melted the white chocolate slowly, on the lowest temperature my stove allowed until it was beautiful and fully melted. I then scooped about a teaspoon of the dulce de leche and sure enough, my entire pot of gorgeous, creamy white chocolate instantly seized. I made sure not to introduce water on any of my utensils or pots or ingredient containers or hands. I have no idea what happened! Did I get the wrong kind of dulce de leche? Mine was a caramel sauce color and consistency. Are there different types? Any help would be much appreciated. Your recipe looks amazing! Is that the same product you used? Unfortunately, yes. that is the exact can I purchased. UPDATE: I read that white chocolate can also seize when liquids which are cooler than the chocolate are introduced, so I gave it another go with my remaining white chocolate. I heated them both at the same temperature, next to each other on my stove. I figured that the time it took for the white chocolate to melt would be a little under the time I wanted to give to ensuring the dulce de leche was at an adequate temperature (and make sure that it wasn’t TOO hot). After that, I added in a drop of my dulce de leche to my white chocolate and like before, my poor chocolate seized. 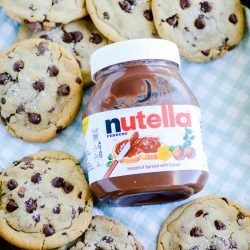 I too had a problem with the chocolate seizing when adding in the dulce de leche, and also used the same kind as both of you. I’ve also worked with chocolate a lot and know how white chocolate is with heating, so it stayed on low the entire time. Very upsetting to throw out so much money in ingredients. And worse to not be able to try this delicious looking fudge! :( If anyone figured out what is causing the seizing, I would love to know so I can try it again sometime. I just made these today and they turned out great! I melted the candy melts in a double boiler, and I heated up the dulce de leche in the microwave for a bit before I added it. By the way, the chocolate kept cracking a little when I cut it (after it cooled down)…not sure if you have any tips on how to avoid this. Thanks for posting! How should this fudge be stored? the white chococlate siezed a little but if you are patient it melts out. this was amazingly easy. I have not made anything except a box cake since i was little (I am 53) and so i needed something to help me get my feet wet. This will be the perfect gift for my girlfriend who loves salted carmel! Just whipped some up and can’t wait to try it! My bag of Wilton candy melts wasn’t quite 3 cups so I added some vanilla bark to make up. It was fine when I added my dulce de leche. It just becomes thick pretty quick. Be sure you are buying the dulce le leche carmel and not the sauce. It got kinda confusing at our local mexican market as there were several types. Mine had a nkce deep carmel color. Heck I could eat that whole can of carmel! I’ll let you knkw how mine turns out.